This hook and loop portable counter is a perfect display for product demonstrations, samples, and promotions. 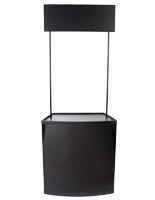 Exhibitors choose this folding fixture for its sturdy design and easy assembly. 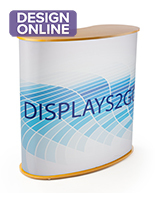 A portable counter, also known as a tradeshow counter, makes a great addition to any exhibit booth, presentation, or point of purchase display. 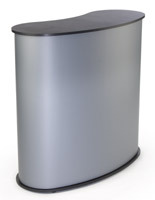 With a bean-shaped design, this presentation stand gives event attendees a convenient place to approach your exhibit. Designed to be mobile and easy to use, this portable counter takes just minutes to setup and break down. 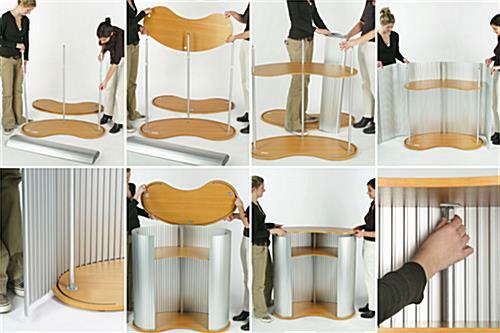 One person can put this piece of furniture together in just a few minutes. 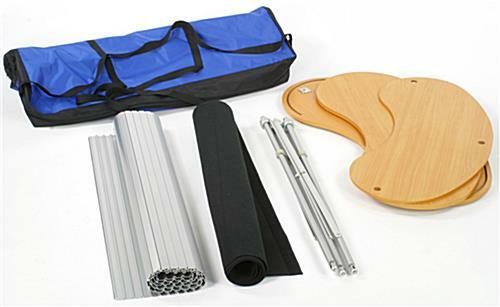 Each portable counter includes its own carrying bag for travel, and wrench for assembly. No additional tools or adhesives are needed to put this unit together. 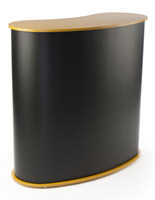 We sell this portable counter with a hook-and-loop fabric attachment for a customizable solution at a low cost. The black fabric color is neutral and complements the light color of the MDF wood base and countertop. 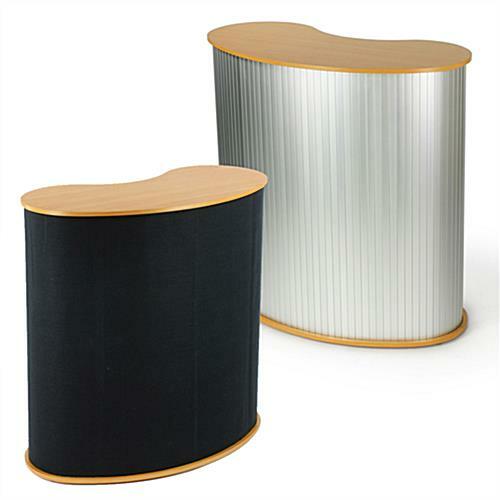 A portable counter, such as a promo stand or tradeshow stand, offers a great reception point or workspace for events. Another ideal use for this mobile fixture is as a demonstration area to show customers how your products work. 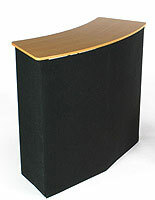 This portable counter is made from high quality materials for a stable and durable display. 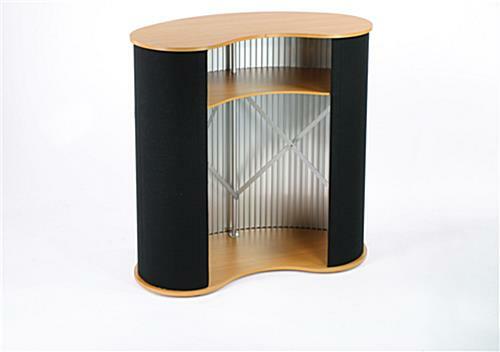 The framing is constructed of a high-grade aluminum, while the base, shelf and counter are made from MDF wood. This portable counter comes with a hook-and-loop receptive attachment that wraps around the aluminum siding, and can be used to attach accessories. The wrap-around fabric attaches to the aluminum with hook and loop strips, and is ideal for holding signs, posters, and literature pockets. You can use this portable counter with or without the attachment for added versatility. One internal shelf is included to provide storage space. 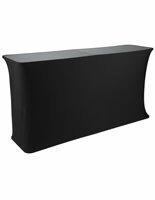 At 40" wide, this portable counter is a great size for tradeshow booths and store environments.